I have spoken at length about my Swedish heritage on my mother’s side but I haven’t yet mentioned that my father was born in Egypt to Maltese parents, I know, I’m an eclectic mix of cultures and nationalities. Many Italians lived in Cairo at that time so this influenced the way they cooked. Both my paternal grandparents loved to prepare a meal and I can recall my grandmother making not only pasta but dishes from the Middle East. 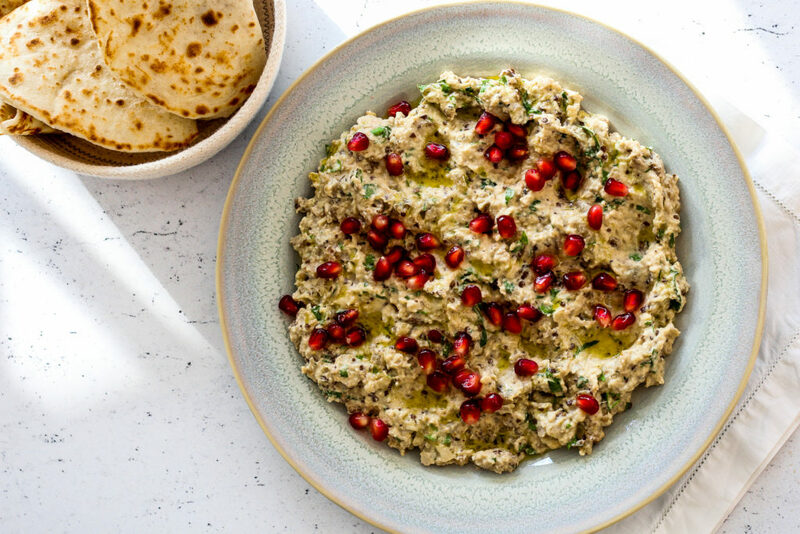 This middle Eastern dip made with creamy aubergine and a sting of garlic is light and airy, accented with nutty olive oil – sounding familiar? 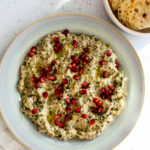 Think of Moutabel as the harmonious twin of babaganoush; almost identical ingredients, expressed just a bit differently. If you didn’t have them side by side, one could easily mistake them for one another. This highly adaptable recipe is not only delicious, but it is nutritious and can be adjusted to suit vegans. I have served this many times at barbecues, it is a real crowd pleaser as my family and friends love a spicy dip. I make my flatbreads with Greek bio live yogurt but if you are vegan you can easily substitute this with almond milk. Personally I do eat meat and love it served with lamb as the inclusion of tahini just works so well. The flatbreads are very simple to make, they can even be prepared in advance, wrapped them in foil and re-heated in the oven. They are even good the next day if they have been stored in a plastic bag. Begin by pricking the skins of the aubergines several times - this will stop them exploding as they cook. Place directly on the hot coals of your barbecue and bake for 25-35 minutes or until soft and charred all over to help achieve a wonderfully smoky flavour. Allow to cool for 20 minutes. If you are baking them in the oven, heat to approximately 225°C, the cooking time may vary. Carefully peel away the aubergine skins, placing the flesh into a bowl and whilst the flesh is still warm mash with a fork and add the tahini, it will incorporate much more easily. Add the remaining ingredients except a tablespoon of the olive oil and the pomegranate seeds. Spoon onto a plate, drizzle with the remaining oil and sprinkle with the pomegranate seeds. Place the self raising flour in a bowl with the baking powder and salt, stir. Now add the sourdough starter and yogurt, mix until you have a smooth dough. Place into a bowl and let it sit for an hour. Divide into approximately 12-14 balls. Flour your work surface and have a hot cast iron pan ready, no need to add any oil. Roll out each flat bread and pop one at a time in the pan, turning when golden on each side.